We’re almost halfway through the 2013-2014 NBA season, so it’s time to take a look at break-out players around the league who have taken big steps this season in their overall game. John Wall-For the 2nd year in a row, Wall is hovering right around 20 points 8 assist and 4 rebounds, but he’s improved in multiple facets of his game, including defense. He’s the 5th in the league in steals and 2nd among point guards in blocks. Wall is also shooting much more efficiently, with a career high 33% 3-point FG% after coming out of college with virtually no outside game. He’s also shooting a career high 84% from the free throw line, up 80% from last year. And to top it all off, Wall has led the Wizards to a record above .500 for the first time since 2009. No matter how trivial that sounds, Wall has had a phenomenal year and taken a big step in his overall development. Goran Dragic-The Phoenix Suns are one of the best feel-good stories in sports the year, after completely overhauling their roster and management, Jeff Hornacek is leading a team projected to be a bottom feeder this year to a 29-18 record and 2nd place in the Pacific Division, but the breakout of Goran Dragic, the former Steve Nash backup, has played just as big a role. He’s up to a career high 20 points a game to go along with 6 assists and 3 rebounds and a career high 39% 3-point FG%. Dragic is one of only 3 players in the league to average 19 points, 6 assists, and 49% from the field. The other 2? LeBron James and Kevin Durant. Anthony Davis-In just his 2nd year, Anthony Davis has already asserted himself as one of the elite big men in the entire league. Davis has jumped from 13 points a game to over 20 per game, while still averaging over 10 boards after averaging just over 8 last year. Defensively, Davis is leading the league in blocks at an astounding 3.4 per game, 1 more than anyone else in the league. He may be just a sophomore, but Davis is quickly showing why he deserved to be the #1 pick in the drat just a year ago. Lance Stephenson-Over his 4 years in the league, Lance has emerged from rotational bench player to one of the best young all-around players in the league on one of the best teams in the NBA. Stephenson’s averaging over 14 points, 7 rebounds, and 5 assists per game, all career highs. All the while, Stephenson leads the league in triple-doubles with 4. 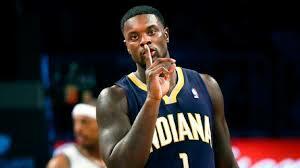 The Pacers are arguable the best young team in the NBA, and Stephenson is slowly showing us why. Did Seattle Win or Denver Lose?